Cemeteries have been called outdoor museums, cultural artifacts, and written and visual records of communities. I am attempting to produce a geographically local biographical or cultural landscape study. In some cases cemeteries are the only identifiable remains of a community. The Plymouth Cemetery records that I have enhanced are just a part of the rich history of the Suldal Norwegian American Community in Juneau County, Wisconsin. It was estimated in 1908 that there were about 1,200 Norwegians from Suldal and about 500 from Upper Telemark in the settlement. Suldal is a rural district in Rogaland County in western Norway. Originally, Suldal was the name of the Lutheran church parish in that area; then a government designated area roughly equivalent to a township in the United States. In 1994, Jon Moe, a Norwegian writer and former editor of the Stavanger Aftenblad, wrote a book, Suldal Wisconsin. 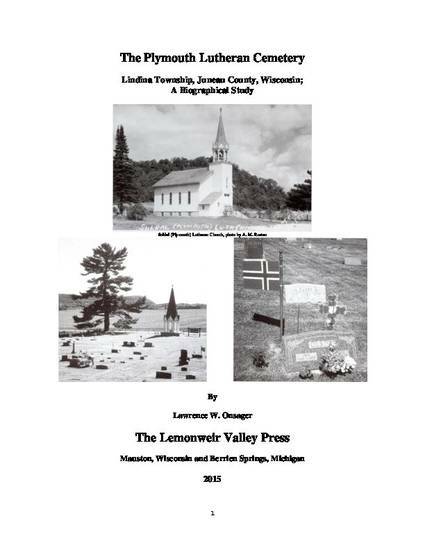 The book was the result of 50 years of contact with the Norwegians in Juneau County whose ancestors migrated from his home kommune or township in Norway. He provides details of the lives of the Suldal immigrants, why they left Norway and how they are getting along in their new surroundings. The name Suldal lives on in Juneau County as the name of the Suldal Road and the Suldal Cemetery. The Suldal country school which was located across the road from the Plymouth Cemetery has disappeared. Suldal Crossing, a hamlet located at the corner of Johnson and Suldal roads, with a post office, store, feed mill and cheese factory has also disappeared. Only the Suldal P. O. appears on the old maps. Twenty family charts have been developed to show the family connections between the church members who were buried in this cemetery. One of the difficulties in knowing family relationships is caused by the problem of Norwegian names. At the time the emigrants came to America, they did not have set last names. Each generation took the fathers first name and added –son or –datter to it. The farm name was then added for further identification.